The security situation in Rivers state Nigeria is getting porous by the day as an explosive device (IED) was thrown at the Deputy Governor, Tele Ikuru’s administration block in the wee hours of Tuesday Dec 17, 2013. Though the Deputy Governor survived with no injury, the bomb explosion caused some damage to the building. There has not been any official statement yet but Mr. Godswill Jumbo, the Press Secretary to the Deputy Governor confirmed that an incident like that happened, adding that he would issue a statement later. Some facts are also emerging that the fire that engulfed the old section of the Mile One Rumuoji Market today may have been caused by an explosive device thrown into the stores in the market. Mrs. Ibim Semenitari, the state Commissioner of Information and Communications, said that arson was not ruled out in the burning of the market as explosions were heard in some parts of the state capital the previous night. 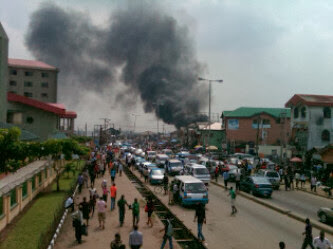 Ibimi said the explosives might have been aimed at the market. More details to emerge later. Pple of river state wht is hppny’n dt allow d evil forces 2 take over ur state.